The film originally came out in the summer of 2003. The economy was still in a slump from the terrorist events surrounding 911. Unemployment was high. The Laura Hillenbrand book, Seabiscuit: An American Legend, about a race horse set in the Great Depression was already a #1 New York Times bestseller. The movie had a solid box-office run and was nominated for 7 Academy Awards. It was not only my favorite film of that year, but I’d put it in the top ten of my all time favorites. In my book it is across the board solid filmmaking on par with Rain Man and On the Waterfront. As time goes by that film will continue to find favor because it is a film with many layers. And the reason I’d love to see a re-release of the film is because the theme resonates even more today than it did even in 2003. Unemployment is higher today than it’s been in the past 15 years. While the stock market hasn’t crashed it has recently seen some of its greatest declines since the Great Depression. And then there is the auto industry. 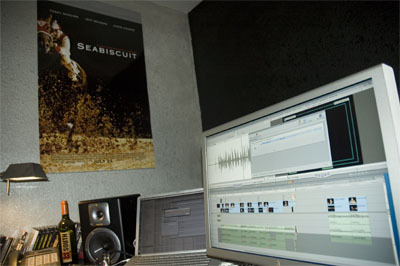 Seabiscuit is set in a time of transition in the United States. A transition from the natural to the mechanical on one level and an examination of the American Dream on another level. And all wrapped together around three broken people and one broken horse. It’s a movie that could have turned into a bad After School Special in the wrong hands, but in careful hands is a classic movie. Of course, one thing that is happening now that wasn’t the case in 2003 is the auto industry is in a slump. What has been called the back bone of industry in our country is in trouble. Reports of sales being a third lower than normal are causing a ripple effect throughout the country. By some accounts the auto industry represents 10% of all US jobs when you begin to connect the related industries. Maybe we could have a double feature with Seabiscuit. Remember the Ron Howard film Gung Ho? It starred Michael Keaton as a worker who has to justify his automotive job with the Japanese company that has taken over. By all accounts some US automotive companies need some major restructuring to survive. In the movie Seabiscuit automobiles represent the future and bring wealth to Howard (played by Jeff Bridges), but it comes at a price. His son is killed in an automobile accident. And it is Howard who must find a way to put the pieces back together again. And along the way there is the forgotten horse trainer (Chris Cooper) and the angry jockey Red (Tobey Maguire) who are all brought together because of an underrated race horse. It’s a story of brokenness and restoration. And of course, this all started with the words written by Laura Hillenbrand as she researched and wrote the book over a course of years. Struggle is not foreign to Hillenbrand who has suffered from chronic fatigue syndrome since she was a college student in Ohio. At 19 she had to abandon her dreams of some day getting a Ph.D. and in an interview with Anne A. Simpkinson said, “I spent the first year of my illness pretty much bed-bound and when I began to improve a little bit in 1988, I needed some way to justify my life.” She turned to writing. In an article she wrote for The New Yorker, A Sudden Illness — How My Life Changed, Hillenbrand recounts the long process of adapting to her new life and how hard it was to write, “Because looking at the page made the room shimmy crazily around me, I could write only a paragraph or two a day… It took me six weeks to write 1,500 words.” Knowing that adds weight to her writing (not that it needs it). If you’re a writer, Hillenbrand recounting the difficulties she endured while researching and writing Seabiscuit will probably give you little room to complain about the difficulties surround your situation. She wrote the first article on Seabiscuit from a tiny apartment in Washington, D.C.
1) Howard’s son who was killed in real life was a teenager and not his only son. By making him younger and the only son creates more empathy for Howard. 2) Howard’s second wife Marcela (Elizabeth Banks) was actually the sister of his son’s wife. But why complicate the story? Plus in the movie there is only one son and he’s killed in his youth. 3) Tick-Tock McGlaughlin the colorful character played by William Macy is a fictitious character. And by Ross’ admission he’s there to compress the needed exposition to keep the story moving forward. 4) Ross also chose to end the movie when a sense of order had been restored in each of the lives. It’s a great jumping off point. But the epilogue in the book is a little different. 5) Hillenbrand writes that while Red lived close to the pulse of Tijuana that, “he appears to have passed up offers from Tijuana prostitutes.” Ross chose to use Red in the brothel as key scene where he learns of his vision problems. This is in the movie because I think there is a quota in Hollywood where x-amount of movies must have a prostitute or a pole dancer in it. If you have never seen Seabiscuit do yourself a favor and see it before the end of the year, and if you just lost your job watch it tonight. Update November 27: Happy Thanksgiving. A day after I wrote this post I saw an ad for a new film called The Tale of Despereaux with the tagline about a “Small Hero. Big Heart.” Sounded kinda like Seabiscuit. I looked who to see who the screenwriter was and it’s Gary Ross. I look forward to that Christmas release. If you’re looking for a Thanksgiving movie to watch today check out Pieces of April on DVD which is a wonderful film I’ve written a little bit about. It stars Katie Holmes and was written and directed by Des Moines, Iowa native Peter Hedges (What’s Eating Gilbert Grape?). And for you indy filmmakers that film was made just a few years ago using a Sony PD 150 DV camera that you can find on ebay these days for under $1,500. 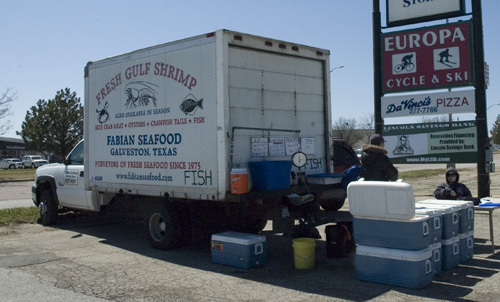 About once a month (in season) a shrimp truck comes to my area in northeast Iowa and parks at a strip mall and sells shrimp and other seafood that were in the waters off Texas a just a few days prior. The truck is only in town for half a day before it moves on to the next town. And the same company has been doing this for over 30 years. That’s what I’d call a niche market. What a great idea to load up shrimp and make a little route where you go each month and build a steady market base for seafood lovers in the Midwest. I’m sure things like this happen all over the world. Niche markets are the result of supply and demand. The feature film Facing the Giants was made for only $100,000 yet opened in over 400 theaters in 2006. 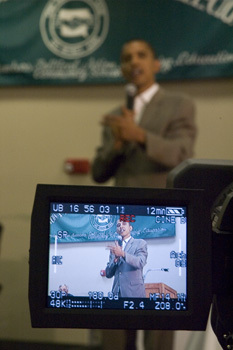 It was funded by members of Sherwood Baptist Church in Albany, Georgia who wanted to make a Christian film. Made with largely amateur actors and a mostly inexperienced crew the film went on to gross over $10 million dollars. A niche market with a faithful audience. The church people made their first feature film Flywheel in 2003 and rented a local theater to show the film one weekend. The first night the film sold out and ended up having a six-week run and then got picked up by Blockbuster Video stores, aired on several Christian TV stations and went on to sell 85,000 DVDs. Not bad for a virtually no-budget film. But to prove that those first two films weren’t a fluke the writers (brothers Alex, who also directs, and Stephen Kendrick) recently produced Fireproof starring Kirk Cameron that is still in the theaters and was made for $500,000. and so far has grossed over $25 million. It’s safe to say that they have tapped into a niche market and done well. And also in Georgia Tyler Perry has his own niche market. Last month the former New Orleans native who grew up in poverty recently built the 200,000 square foot Tyler Perry Studio on 30 acres in Atlanta. Guests in a attendance at the grand opening included Will Smith, Sidney Portier and Oprah Winfrey. The former high school dropout was inspired one day watching The Oprah Winfrey Show in 1992 and wrote a musical dealing with child abuse. While working as a car salesman he staged his first play which was not a success but he continued to hone his writing over the next six years. He began finding success in 1998 with a solid African-American audience and since then has made over $150 million with his plays, DVDs, and feature film releases. Perry is also producing for TV (Tyler Perry’s House of Payne) and also has written a novel (Don’t Make a Black Woman Take Off Her Earrings: Madea’s Uninhibited Commentaries on Love and Life) that was number one on the New York Times Best seller list in 2006. Many in Hollywood are reportedly confused by Perry’s success. You may not have seen any of Tyler Perry’s movies (or have even heard of him) but he has had four number one box office movies and this year he was named in Time Magazine’s 100 Most Influential People in the World. I first learned about social marketing from Nathan T. Wright at Lava Row not that long ago and now see it everywhere. It’s a natural fit for those wanting to tap into a niche market. (Did you know there is a website just for people interested in people with Mullets? Mullet Passions.) Screenwriter Diablo Cody has more than 18,000 friends on My Space. Do you think that might help her post Juno career? Both Perry and the Kendrick brothers are once again proof that you can have success in the film industry outside of the traditional Hollywood route –out there in fly-over county. And that it doesn’t hurt to not only have faith in your screenwriting, but faith in your movies. Side note: Back when Kirk Cameron was on Growing Pains I did a shoot with him on the Warner Brothers lot in Burbank for a show called Bridges. It was a three screen multi-media program sponsored by Pepsi and shown to hundreds of thousands of high school students across the county. If I can find a clip I’ll post it later. Kirk seemed like a one of the good guys and I’m glad to see him still making films verses being in the news as another example of a child actor gone bad. Michael Crichton died last week and he always seemed to me someone interested in what it meant to live. The first movie I ever saw of his was Westworld when it first came out in the theaters when I was a youngster. Yul Brynner was stunning as a robot-gunslinger who malfunctions. I haven’t seen that film since it was first released, but after Jurassic Park came out I did recognize similar themes before I even connected them both to the mind of writer Michael Crichton. 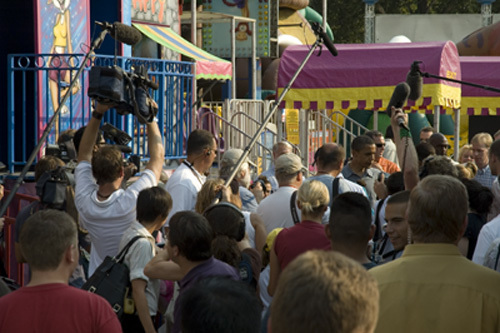 On one level both deal with amusement parks gone wild when the technology man has created back fires and lives become endangered. Anthropology is is the study of humanity. That is a deep field of study and one that is naturally connected to screenwriting. Movies allow us to explore ourselves and our surroundings, as well as other people in other cultures. They allow us to see how others react in a given circumstance and in turn we ask what we would do. One reason why The Shawshank Redemption is so highly revered is because while most people won’t spend time in prison they can relate to the situation–their own personal prisons. (Perhaps at home or work.) They can identify with a character or two–the good and the bad. Over and over again people write and talk about that movie giving them hope or helping them get through a difficult situation. Knowing how humans interact is why President-elect Barack Obama says that The Godfather I & II are his favorite films even though Italian is not a part of his multi-cultural background. He said it’s for the theme of family respect and honor. I bet somewhere there is a class somewhere called Anthropology 101; The Godfather. If you’re a writer, the assimilation of important experiences almost obliges you to write about them. Writing is how you make the experiences your own, how you explore what it means to you, how you came to possess it, and ultimately release it. Thirteen of his books became movies and as the creator of the long running TV show ER he won an Emmy, a Peabody, and a Writer’s Guild of America Award. Of course, Crichton had a Midwest connection being born in Chicago and co-writing the screenplay for Twister filmed partly here in Iowa. Crichton was an insightful writer and long before it he was diagnosed with cancer he wrote an article for Redbook Magazine in 1991 called Happiness that’s worth a few minutes of your time. Michael, thanks for the thoughts, words and provocations. Professional gambler Peter Eastgate became a multi-millionaire at 5 AM yesterday morning when he won over 9 million dollars–and a gold watch–at the main event at the World Series of Poker in Las Vegas. The 22-years-old from Demark also became the youngest person to ever win the tournament. But back in 2003 Chris Moneymaker (yes, his real name) won the same tournament and became the face of Internet gambling. He parlayed $39 into $2.7 million dollars. He had never played in a live professional tournament, but he had gotten so good playing online poker that he could beat all his friends. And he was inspired by the movie Rounders in which Matt Damon plays a poker player in the World Series of Poker. That’s one more example of movies reflecting the culture they help create. Now there is talk of a movie being produced on the life of Chris Moneymaker. Maybe Matt Damon can play the lead in that as well — just to keep the cycle going. But what does all this have to do with screenwriting? Once again the key is learning a skill and using the Internet. Just like Diablo Cody (Juno) being discovered on the Internet, Chris Moneymaker refined his game on the Internet. I don’t think Cody and Moneymaker were as lucky as they were prepared. (Moneymaker did earn a Masters degree in Accounting and had played cards since his youth.) They were prepared for the moment that came there way. The same is true for C.S.I. franchise creator Anthony Zuiker who was working at Vegas Hotel when he translated some experiences at work into an immensely popular TV franchise. He had graduated from University of Nevada Las Vegas with a BA in English. He wasn’t sitting in a coffeeshop in L.A. talking about be a screenwriter. He was in fly-over country (fly-to country?) working a regular job to pay the bills and keeping his eyes open for story ideas. Las Vegas itself is an iconic and fascinating place that I have watched reinvent itself it few times over the last 20 years since I first drove through there in college when they still had $3.99 steak dinners. The last time I was there was four years ago for a video shoot and happened to catch them shooting Miss Congeniality 2 at the Venetian. Vegas may not be a hotbed for creating writers but the atmosphere itself is conducive to a wide array of storytelling. If you have a screenplay set in Las Vegas then look into the Nevada Film Office Annual Screenwriting Competition. It’s open to all unsold writers, though 75% of the screenplay must be filmable in Nevada. And since we’ve touched a little more on the internet, I think the first book that touched on the web for screenwriters outside L.A. is Christopher Wehner’s Sceeenwriting on the Internet. Wehner also launched screenwritersutopia.com back in 1996 which is packed with helpful information. 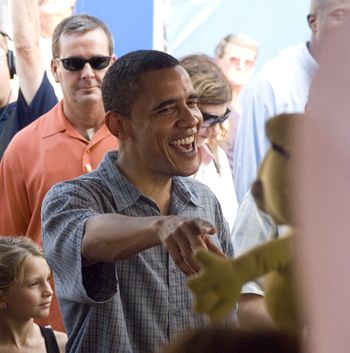 Now Obama is already a pretty cool cat, but he still needs a howdy factor. And while he does play golf, I think he’s going to be the first President with a penchant for basketball. That’s part of his regular workout these days so as long as his knees and legs hold out I think that’s what he’ll be about. George Clooney said that he liked the character he played on E.R. when he read the first script. Though his character was flawed, at one point he saves a dog and knew that he was a complex character that people would embrace. Of course, it doesn’t have to literally be a save the cat scene, but it can be. In I Am Legend, Will Smith’s character is on a hunt for food when he comes upon a lion that looks like quite a few meals. He raises his gun to shoot, but doesn’t pull the trigger when he sees a baby lion come around the corner. He decides to let the animals go (save the large cats) and it’s meant to convey he’s a good guy. In the Fugitive Harrison Ford’s character is falsely convicted of killing his wife and is sent to prison. On a bus ride to the prison with other prisoners the bus is hit by a train and the prisoners flee the wrecked bus and escape in the night. But before Ford escapes he takes his time to save an injured prisoner. A save the cat moment to prove that he is a good man setting up that he really is innocent of killing his wife. It’s best to show a howdy trait as early as possible. They are usually found in the first act if not in the first 10 pages in many screenplays because they are a shorthand way of establishing character. Do you have any howdy factors in the script you are working on now? Now that I think about it there is also a “kill the dog” scene in I Am Legend, but even that is a compassionate act. Oh, and by the time Obama finished his tour of the White House today, I bet he knew exactly where he was going to put the b-ball court. Did you catch the Texas–Texas Tech game last Saturday? That was high drama. And everything I love about college football. A close game down to the last second. Did you happen to follow the 2008 presidential election results last night? Not quite as close a game. But there was still plenty of drama in the last year and a half race to the White House including a full lineup of sideshows acts; Joe the plumber, The Obama girl (not to be confused with the John Edward’s girl), Super Tuesday, Sarah “Barracuda” Palin’s troopergate, Biden’s blunders, Rev. Jeremiah Wright’s preaching, Huckabee’s humor, Hillary Clinton and her 18 million cracks in the ceiling, and even Oprah coming to Iowa. Congratulations to President elect Barack Obama. I was able to see 13 presidential candidates as they came through Iowa and I really never thought Obama would get past Hillary. But there he was last night showing that Dylan, Springsteen, Louis Farrakhan, Pamala Anderson, Colin Powell, Jimmy Buffett and Warren Buffett were all on the eclectic winning team. 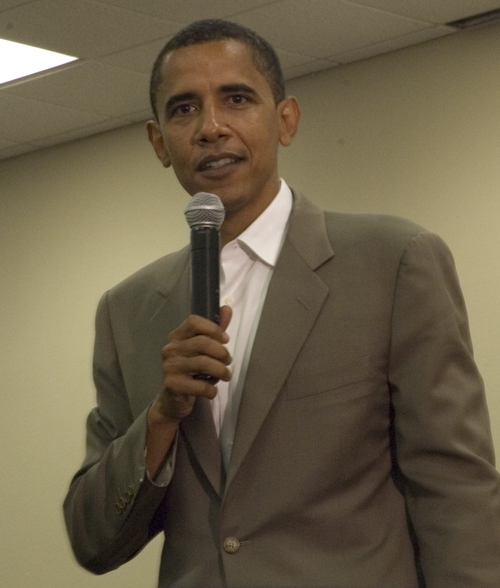 Obama overcame his lack of experience with his message of change along with the storytelling abilities of Ronald Reagan and the inspirational chants (“Fired Up–Ready to Go!”) of a motivational speaker. So 40 years after Martin Luther King Jr. was shot and killed we have an moment in history that represents symbolic healing. It really has been amazing to be a part of democracy in action at such an in-depth level. Who knew Iowa would play such an important role in history? Never did I think when I moved to Iowa from Central Florida five years ago that I’d be close to such a dynamic election. 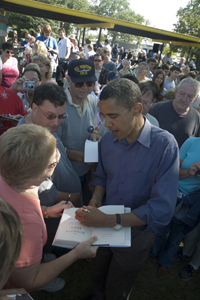 So close in fact that I was within a couple feet of the future president of the United States of America several times in 2007 taking photos and shooting video on assignment. Watching the gazed faces on TV at Grant Park kinda looked like that old footage you see of when The Beatles played at Shea Stadium. But America didn’t elected a rock star. No, from the looks on the faces he’s bigger than that. More like a mix of Bono/JFK/MLK/Michael Jordon/Muhammad Ali/Billy Graham/Tiger Woods and Oprah –all in their prime. Last night I couldn’t help but think back to my creative writing teacher in high school where I wrote my first scripts and directed my first videos. Dr. Annye Refoe, who happens to be African-American, took this sports and girl obsessed teenager and added color to his world beyond the athletic endeavors of Paul Warfield and Joe Morgan. All these years later, she was one of the first people I contacted when I won the Emmy last week. I also thought back to when I was a 19-year-old journalist and photographer and I interviewed then Tampa Bay Buccaneer quarterback Doug Williams for the Sanford Evening Herald. Williams went on to become the first African-American to be a winning Super Bowl quarterback (while playing for the Washington Redskins). Obama was born a month after I was and the arc of racial change that has occurred since then is stunning. But we have a long way to go to realize Martin Luther King’s dream that one day the color of our skin won’t matter. This election gets us over one hump but I am reminded of the saying that every problem has a solution and every solution has a problem. We have not reached the finish line. Anyway — speaking of Washington D.C. –this is a blog about screenwriting so let’s look at the inspiration and movies that has come out of that rather small area of land. The political scene and the drama surrounding it is a natural fit for Hollywood. The quintessential Washington film is Frank Capria’s Mr. Smith Goes to Washington starring Jimmy Stewart. The film earned an Oscar nomination for screenwriter Sidney Buchman who happened to be born in Duluth, Minnesota. Between 1941-42 he served as the president of the Writers Guild of America, but was later backlisted for his refusal to name names of those in the American Communist Party to the House Committee on Un-American Activities. And coming out of the historically black Howard University in D.C. are writers Zora Hurston Neal (Their Eyes Were Watching God), screenwriter and Oscar-nominated director Dianne Houston, director Ernest Dickerson who has also been the cinematographer on many Spike Lee films, Richard Wesley (Let’s Do It Again, which was directed by Sidney Poitier), Pulitzer Prize-winning playwright Margaret Edson (Wit), poet Paul Laurence Dunbar as well as a host of actors and actresses including Ossie Davis, Phylicia Rashad, and Sean (P. Diddy) Combs. And American University is not only home to one of the best film programs in the country, but where the top box-office female film director, Nancy Shyer, graduated from college. Shyer not only directed Mel Gibson in What Women Want but also co-wrote Father of the Bride, Baby Boom along with being nominated for an Academy Award back in 1981 for co-writing Private Benjamin. The Oscar winning director of Rain Man and screenwriter of Diner Barry Levinson also attended Washington University. As did actors Jude law and Jack Black. There are also probably a few screenplays in the works on Obama’s life. (I bet Spike Lee and Tyler Perry are racing each other to be first.) Even if you didn’t vote for Obama you have to appreciate the journey–or at least the narrative or the significance. Of course there will be plenty of conflict in President Obama’s office. (Probably beginning day one at three in the morning — if not before he even takes office.) I’m sure before the final ballot was cast that Iran, Russia, and North Korea were moving chess pieces around preparing to welcome our new president. January of ’09 will be a hard time to take over the role as president and Obama’s leadership skills will be tested early. We quickly forget the pattern of almost every election, hope on the promise of change, harsh realities followed by blame of prior administration, and a plea for four more years to finally get things on track. Obama simply cannot do all the things he’s promised and people tend to become disillusioned quickly. I just hope the criticism (and the joking from comedians) is not confused with racism or it’s one step forward and two steps back. If Powell is right about Obama being a transformational candidate, I just hope that transformation is for the good. Meanwhile the thought to be washed-up old-timer (and Iowa native) Kurt Warner is the starting QB for the Cardinals and who Sports Illustrated said is the clear choice for MVP at this point in the season.